Including an independent web resource that will be of interest and use to everyone interested in the world of sundials. Over 130 documents are now archived or linked Here! Make sure to email Yes@ppowers.com today!! BSS 2018 Accounts show a correction of an Accounting Error. The 2018 Accounts for The British Sundial Society disclose an error in the statement of Gift Aid for the previous year which was not spotted either by the Trustees or by the Examiners employed to check the Accounts each year. The Trustees' Report has not yet been submitted to the Commission but the Accounts for 2018 may be seen and downloaded here. Is Pluto really a planet after all? Scientists are now coming to argue that the official definition of a planet is ‘sloppy’ and that Pluto should never have been downgraded in the 2006 review by the IAU (International Astronomical Union). The 2006 definition was devised (it seems) more to stop too many planets being declared than ever it was to provide a sensible definition. The discovery in 2005 of Eris, a body more massive than the smallest then-accepted planet, Pluto forced the issue and the new definition thereafter has required a 'true' planet to be roughly spherical, orbit the sun and to clear its orbit. Pluto and Eris fail, not surprisingly, to clear their part of the Kuiper belt and in any case University of Central Florida’s planetary scientist Philip Metzger points out that strictly speaking no planet clears its orbit not least because of the newly discovered dust rings in the orbits of Mercury and Venus. Maybe the definition of a planet should be set by diameter and whether or not a sundial can be constructed for it anywhere on its surface? Time Lapse Videos of sundials and shadows? YouTube is an excellent source of interest where sundials are concerned. If you have ever wanted to see a time lapse video of shadows moving with time and/or with the seasons and related aspects do take a look here. Now take a look at some of the replies! And you thought scientists were logical? Does the NYT really hide the truth about warming? Is this interesting analysis of how the New York Times reports temperature changes since the 1960s really as fraudulent as this article suggests? Then see this about other possible frauds. Then click on the Orange button in the upper left of the screen marked "DOWNLOAD PDF (12.3MB)". The file will then be downloaded to your PC. Get it whilst you can!! Jim Tallman's Artisan Sundials page is well worth a look. Artisan sundials are specially designed and constructed to provide accuracy as well as a genuine sense of presence in time and space. They are authentic scientific instruments that are carefully constructed and capable of telling very accurate time. Jay Campbell's New Dial Have a look at Jay Campbell's new sundial in New Mexico USA. It (like his accompanying website) is just nearing completion but there will be an article about it in the December issue of Sky & Telescope magazine, available in late October. "Have you ever purchased a delightful sun dial for your garden, but found it does not work? No problem". That is the encouraging beginning of an excellent article in PDF format that discusses how to take a store bought dial and then adjust it so it will work for you. Entitled "REVERSE ENGINEERING STORE-BOUGHT GENERIC DIALS" It is just one extract from the fascinating book "ILLUSTRATING TIME'S SHADOW" by Simon Wheaton-Smith whose website (already mentioned elsewhere on this page) is an incredible resource for all diallists. The National Oceanic & Atmospheric Administration of America (NOAA) is well known for its research into greenhouse gas and carbon cycle feedbacks, changes in clouds, aerosols, surface radiation, and recovery of stratospheric ozone. In Sept 2018 it released a report claiming that the summer of 2018 was the fourth hottest on record in the US, and it went on to claim that this summer was just as hot as 1934. Yet, when this claim is examined it turns out that it may not be correct. Listen to a US scientist's analysis of this and read about some of Heller's other concerns about climate science misinformation today. Form your own opinion. - The Equation of Time - 8 pages. - Mechanical Means to Simulate the EoT - 6 pages. Have a look at Karen's Page! Want to make a sundial and compass from your own fingers, a sundial and compass from an embroidery hoop. an origami sundial wristwatch. a horizontal sundial using only compass, straight edge and protractor or use your hand as a nocturnal or even make a Universal Capuchin sundial? This is the place to come! SunInfo's Archive Pages. This, our main page, gets larger and larger as time goes by and of course the page would get slower to load. However, many of the stories, comments and information in it are still of interest even though they may not be recent. Accordingly we archive most of the older entries so that little or nothing is permanently lost. Our Archive Page 1 and, from 2018, our Archive Page 2 are available!! Have a browse of them for yourself. Is the answer simply Scientific Apophenia? Climate scientists are looking for evidence that supports the AGW hypothesis — and because they are looking for it, Kip Hansen believes they see it in everything. The evidence, so far, simply does not support the inference that the Earth’s climate is changing dangerously. Perhaps only persons suffering from Scientific Apophenia see dangerous climate change in the chaotic, random patterns of long-term climate metrics. Click on the image for a bigger version and read this for more. Peter Daykin's Derbyshire Sundials Page is well worth a visit - not least because it includes such examples as a cross dial and of course the famous Eyam Dial. The website includes details of many Derbyshire dials and even includes three sundial calculators. On almost every page there is a description of the location as well as of the dial. A delight to peruse. Interested in browsing our library or our archives? Our extensive library of Dialling Documents and related material is HERE. It is regularly added to. ALSO our earlier stories and News Items up to 2017 are Archived HERE and, from 2018 onwards HERE .In both archives entries are stored 'earliest-deleted' at the top, 'most-recently' deleted at the bottom. We hope you enjoy them. SunInfo's Equation of Time figures for 2018, with a one page output available too! Click on the image to be taken to our EoT page! where you can check the value of EoT at Noon GMT on any date in 2018 (or even some earlier years) and can even print all the year's data on one A4 sheet too. There's more there describing how to correct a sundial's solar time reading to GMT/BST and even a way to buy a little card that allows you to do this when out and about anywhere in the UK or Ireland! Some Complications of Dial Refurbishment as considered prior to the restoration of the Queens' College dial in 2006/7. This is an interesting document which is well worth a read by those facing similar problems! Includes the oldest known photograph of the dial and consideration of the several issues that remained after the previous repainting in 1971. The John Churchill Collection! SunInfo is delighted to be able to present a collection of just some of the photographs of dials that former BSS Trustee John Churchill and his wife took during his lifetime. They represent an eclectic selection of his interests and as well of course, a valuable and lasting record of the condition of the dials up to the time of the millennium. Click to be taken to the John Churchill page. The Dial of William Hughes of Bryngola. In what can only be described as a tour de force of investigation, John Davis recently studied a dial dated 1775 which was made for William Hughes of Bryngola in Llangwyllog, a small village and ancient parish in the centre of Anglesey, Wales. The church of St Cwyllog (illustrated) still bears memorials to the family to this day. John deduces that the elaborately engraved dial may have been made for Hughes by one of the Owen dynasty of clockmakers perhaps using components from the clockmaking area around Prescot in Lancashire. A fascinating BSS article which may be read at John's website at this link Dial of William Hughes. A lovely selection of Italian sundials Here is a link to a whole load of images of Italian sundials that have been taken by photographer Darek Oczki in the areas of Umbria, South Tuscany and Rome between August 2010 and September 2018. Some (under the Activity sidebar) are earlier. Well worth a look! "Zegary słoneczne Italii"
The Sundials at New College Oxford. In an interesting article Harriet James describes the dials that have existed at New College Oxford - the college that was 'new' in 1379 - and gives an interesting insight to her replacement of one that was on the Muniment Tower in 1696. Read the text of Harriet James' BSS Article in 2000 to know more about the Sundials of New College past and present. BSS Member Ian Maddocks has really started something by finding a whole load more dials that are apparently currently unknown to BSS! In two messages to the International Sundial Mail List he announces his discovery that Twitter® and Instagram® contain many mentions of UK dials that are not recorded in the most recently published BSS Register of Dials - though of course some may be held on file by the Society's Registrar ready to be published next time. Whatever, this is excellent news for all those interested in dialling. Not only that but Ian has combined a list of these on his Google drive. They may be viewed here. There is also a 'map' of their locations here. Now with Graham Stapleton's help he has added even to this amazing number and with pics too here. BSS President Christopher Daniel's web site has now been seen more than 890 times since it was set up only a little time back. The site contains images of all of Christopher's dials and images of other related matters taken during his long and varied career. To see this wonderful collection of several hundred images just follow this link - or of course you can always simply Google "Christopher Daniel Collection". You can even see his pictures as a slideshow! Newton's Sundial Courtesy of Ian Maddocks and the Objectivity YouTube channel we are able to see a short video clip which, after half way, shows one of the stone dials scratched by Isaac Newton into the walls of his home. Click on the image for a larger picture, Here to see the video and Here to see the record document of items like this from Newton's home. which have a sloping gnomon, which appeared in the 16th century but which only came to some rural areas in the mid 17th century. The growing interest in mass dials in continental Europe is evidenced by a flow of reports and photographs. BSS of course has quite enough to do without compiling registers of overseas dials but the reports are filed and available for comparison with dial types and locations recorded in Europe. Here Tony Wood reflects on the similarities and origins of mass dials in the British Isles and Europe. Astrolabes, Cross Staffs and Dials. Way back in 1992, Peter Ransom, later to be elected President of the Mathematical Association, published a fascinating article extolling the use of old scientific instruments when teaching geometry in schools. His article makes wonderful reading and gives the background to (and the use of) the Cross Staff, a Horizontal Sundial and even a quadrant. Click here for a link to this article. NB Free registration to MyJStor allows free on line reading of this article. A small charge is required to download and keep the whole article. Mystery of a Missing Dial. Way back in September 1992 super-sleuth John Ingram spotted this unusual and it is believed, unique, dial where steps on a triangular block were used to tell the time. When he returned in 2004 to York Rd on the South Bank in London to record it for the BSS Register, it was missing! Enquiries of the Council were all to no avail. Was it stolen or was it lost in the then recent Jubilee Line Tube works? Click on the image for a wider view. The telegraph pole in the middle right of the larger image is said to mark the place where the Festival of Britain Skylon stood in 1951. Anybody able to tell us more about it, its designer and who made it? Replies to the Webmaster please. Photo courtesy of J Ingram. SunInfo opens a New Page! - listing the HUGE bibliography of BSS President Christopher St JH Daniel MBE. Listed here are his published articles, the full list of his many contributions to Clocks Magazine and even a summary of the sales of his extraordinarily popular Shire Publications book 'Sundials'. We are delighted to be able to provide as an academic resource the incredible output of the UK's foremost Diallist. Have a look at Illustrating Shadows. The website of Simon Wheaton-Smith is an excellent dialling resource with lots of downloads, presentations, dial designs etc. Most free and all well worth a look. You can access it here. The Sundial Removed? Here Harriet James tells the story of the 'Simmons Bequest' that threw up the idea that the huge dial in All Souls College Oxford might be returned to its earlier place in the College. The early history of the dial is here, Christopher Wren and William Oughtred both make an appearance and all is followed by the final decision by the College. Read the BSS Bulletin article dated 2006 for yourself here [C-466/12]. Sundials to see. A new venture for SunInfo. Here is a changing section of dials that are worth visiting. This time it is the Millennium Dial in Greenwich Park in London. It was designed by BSS President Chris Daniel. BSS 2016 Accounts finally available. Owing to what is presumed to have been an administrative problem at the Charity Commission, anyone wishing to see the 2016 accounts for the British Sundial Society had not been able to view them on the Commission's website - only the Trustees' Report was initially available. Both may be now viewed at the link above (courtesy of the CC) or at the Commission's website. The latest accounts show a welcome profit after the earlier years of worrying losses. Why not get The Recorder's Reference? It provides anyone interested in dialling with a way to estimate by how much a non-direct-south vertical dial declines and also finds the design latitude for any horizontal dial. Lost Dials of the UK. A new feature has been instituted here on SunInfo to present some examples of interesting but now lost UK sundials, starting with the one at the Mansion at Bletchley Park in Buckinghamshire. Check them out ►here. The Holes and History of the Beccles Church Dial - an anniversary! It was ten years ago in 2005 that the mystery of the holes that are pierced in the remains of the vertical dial on Beccles Church in Suffolk was unravelled. The BSS Registrar at that time was Patrick Powers and in an earlier article in the BSS Bulletin he had posed the question. Quick as a flash, two eminent BSS diallists explained it all. A second article in the BSS Bulletin was clearly necessary! Read that article here to find out the answer and to have a chuckle at Roger Bowling's succinct summing up! Smiling Sundials . Pareidolia or what? Here are two dials that seem to be smiling! They are both in Germany. The first is in Dörnthal, Sachsen and pareidoliathe second in Nuremberg. How many more do you know? A NEW Sundial Data Resource has been developed by Kevin Karney. Available ►here the page provides a wide variety of data for those interested in sundials and solar parameters. The latest addition is to provide a high precision calculator for the Equation of Time and the sun's position. However the page also contains links to dial designs of his own and to animations of dial shadows. Well worth a look! Did you know? An astonishing number of pictures of sundials and their pedestals can be found by searching Google®. Try looking here for one amazing collection. Here you can see both sides of a rare Melvin dial, a few other very old dials, some heliochronometers, modern dials and of course some non-working 'garden centre' dials as well. Well worth a look. Want to know something about Sundials in the Southern hemisphere? Then there's no better introduction than the web site of the company Sundials Australia, owned and run by physicists and BSS Members, Margaret Folkard and John Ward. Sundials of New Zealand. Rosaleen Robertson runs the Sundial Association of New Zealand and also operates a Sundials Blog, (sundials-rosaleen.blogspot.com) which shows some of the sundials and sundial Trails in New Zealand. Worth a look. A list of web addresses relating to the NZ Sundial Association is ►Here. Want to know more about sundials? Then there is no better place to learn about all aspects of the topic than from Wikipedia! Click here to see this important article. Interested in Sundials? Then make sure you join BSS. Why should you join the British Sundial Society when there is so much information available for free on the Internet these days? Look here for seventeen reasons why you should join BSS!! The James River Studio website includes a section on sundials and more particularly includes some excellent sundial design software which is easy to use and understand. The Sundials of Country Life Magazine. Why not take a tour from your armchair of all six pages (well, five and a bit!) of the sundial photographs that are in the Picture Library of Country Life? Some may not even be in the BSS Register! The Elihu Yale dial of Glemham Hall is there in 1910 though! Have a look here. Sundial Societies, Groups and Websites of the World. Click ►here for a list of many Sundial related sites, their web addresses, when they were founded and their popularity. Make your own paper sundial. Fabio Savian's collection of 13 amazing designs for paper sundials are now available to all. He has designed several but others like Valentin Hristove and the North American Sundial Society have also contributed designs to this excellent Sundial Atlas project. Just have a look ►here ! There's even a design for a solar compass. Or you can go back to this 2004 BBC page for Norfolk Children. It too tells how to make a paper sundial. It will work for most of England though you will need to correct the reading a little if you want to measure clock time. Francis Barker's Instructions for Setting a Dial. Francis Barker of Clerkenwell was an important dial maker at the start of the 20th Century. In 1914 he contributed a chapter about setting up a dial to Geoffrey Henslow's Book: 'Ye Sundial Booke', 1914. This chapter makes interesting reading. Edward R Martin's Mass Dial Database was compiled by him over many years using an early computer and specialist software written by his son. In fact all the data was at one time thought to be lost following a computer failure not long before Edward died. In 2002 the factual detail of the database - though sadly not his novel customised dial diagrams - were eventually recovered for him in 2002 by Patrick Powers but, after his death, amazingly were again mislaid until now. This database of some 1000 mass dials includes some details that are not now recorded even in the BSS Mass Dial Register. A guide to Edward's novel codes for the locations of the dials on the church is included. NB An Excel version (3.3MB) may be obtained upon application to the webmaster. A Day out with Edward Martin and Mass Dials. A rare record of a day which CLIVE FEWINS of the Independent spent with the late Edward Martin. It was on Saturday 20 July 1996, when they looked at the marvellous mass dials on St Peter's Church in Hanwell near Banbury. Click HERE to read it. Spot dials from your Armchair! Courtesy of Google Street View® have a look at some dials that can be seen on it. Keep coming to look at what's new! Just click on this link. Over twenty now recorded. One of the dials to be added is BSS Trustee David Brown's Olympic sundial. St Botolph's Church double dial in Cambridge is another. When next in Northern Ireland why not visit the sundials of Carnfunnock Country Park's Time Garden on the coast road near Larne, Co Antrim, NI. See what's there here. 10 Reasons to revisit a Registered Dial. Many BSS Members send in reports of dials to the Registrar for inclusion in the National Register. Although at first glance it might not seem to be necessary to revisit an already recorded dial, this is not the case since repeated visits over time provide a record of a dial's changing condition and also can provide more information about the dial than might have been noticed earlier. In October 2007, BSS Member John Ingram sent in his amusing and rather 'tongue in cheek' list of ten reasons for revisiting a dial. Read them here. Are you able to help BSS? 'Induce Animum Sapientem'. There is an interesting sundial web site which is operated by dial makers Peter and Yvonne Daykin. It is devoted to the sundials of Derbyshire and is well worth a look. Their Home Page is here. More than twenty five dials are shown, some modern and some old. The famous Eyam dial is there too! Its motto is the one opening this paragraph. It means (roughly!) "Cultivate an Enquiring Mind", something that could be the motto of this webpage. The Sundial at All Saints' Church in Isleworth has now been restored. Installation took place during Saturday 25th May 2013 and the sun actually shone for the occasion! A picture* of it complete, but just before installation is ►here. As well as the ordinary problems associated with any dial restoration this one had a few more! Some initial information can be seen ►here. and for BSS Members an article about the restoration is in the June 2014 edition of the BSS Bulletin. Alternatively, a copy of the same article may be read by everyone ►here. *Perspective slightly adjusted in view of the difficulty of photographing such a large object indoors! Interested to have access to more information about the operation of BSS? Then why not go to our private BSS Members page. [Password access available upon prior registration with the webmaster]. Medway Council eliminates one of the Nation's most important sundials! In an extraordinary move, Medway Council in Kent has chosen to take down one of the most famous sundials in the country, SRN2936 in the National Register, which was in Railway Street, Chatham and which commemorates both the day and the time of the death of Admiral Lord Nelson. The dial was designed over twenty years ago by Christopher Daniel MBE, the President of the British Sundial Society, and it has been a major feature of the town since then. It is a dial known to thousands both in the UK and overseas. The worrying thing is that there is currently a suggestion of it being placed in a museum - all rather suggesting that the problem of reinstallation had never been considered let alone planned. More can be found about this in the article in the 9th March edition of Kent on Line. Click here to read more. Then Click here to read Chris Daniel's 1995 article about the original installation and how Chatham regarded it then! Hint: In 1995 it was then regarded as the 'Jewel in the Crown' of a £5.5M investment to improve the environment of Chatham! How the Council's knowledge of the town has changed. NOW!! see the further Kent on Line article about this - here and go here to read NASS's comment of 14th April on this worrying development. BSS also became involved in this on 15.03.17 and they too have written to the Council. Let us hope that Medway Council reconsider. Now the local MP (Tracey Crouch) is involved and the Nelson Society has been informed. If you wish to register your concern about this most unwelcome development the contact is Alan Jarrett, Leader of Medway Council, Gun Wharf, Dock Road, Chatham, Kent, ME4 4TR. Just imagine! Places where sundials work in the summer but not in the winter - even when they might be bathed in sunshine throughout the year? You might think this cannot be but in Viganella in Italy and now in Rjukan in Norway that is so. How so? Read here. April's News from Border Sundials The latest addition to 'News from Border Sundials' can be read here. This edition mentions the Sundial on Wilton Bridge, Ross-on-Wye, Herefordshire. Read about its history, why it was moved and read its depressing motto: "Esteem thy precious time; Which pass so swiftly away; Prepare thee for eternity; And do not make delay". The sundial was commissioned by Jonathon Barrow - originally from Monmouth but who lived in Bridstow just outside of Ross-on-Wye. 11.04.19 Image © Pauline Eccles & licensed for reuse under the Creative Commons Attribution-ShareAlike 2.0 license. Gianni Ferrari The Sundial Mail List today reported the death of Gianni Ferrari on the 27th March 2019. Gianni's definitive contributions to dialling discussions raised over many years on the Sundial Mail List have contributed much to the education of diallists everywhere and have delighted them in equal measure. His book about Islamic sundials has been acclaimed by many as a masterpiece but it will surely serve as only one aspect of his amazing dialling legacy. The gnomonic world has indeed lost a leader. Reinhold Kriegler SunInfo is very sad to report that the sundial enthusiast Reinhold Kriegler died on Saturday 23th March 2019 in Dessau. Over his lifetime he made many contributions to the field of gnomonics. For those who remember his extraordinary web site it still available to view and is at http://www.ta-dip.de/ or more specifically for his dialling work at http://www.ta-dip.de/sonnenuhren.html. In there he describes his on going interest in the Reinhold crater on the moon - not of course named after him but still precious to him nonetheless! Just one of the many comments says it all: "Kriegler exemplified the best of what a community of dialists would be like. The most civil, civilized, inoffensive, polite, considerate, member. Those attributes stand out, aside from his impressive website with its wide coverage of dials and dialists worldwide, and his own artistically-aesthetic dials". RIP. Using two sundials to destroy the idea of a flat earth!! Here's an ingenious YouTube clip that shows a way of using two sundials and a lamp to prove the earth cannot be flat. Additionally it includes a link to a place where you can print off a foldable paper sundial for any place on earth. How about that? Use two sundials and a book to prove the earth is not flat! The Delightful Dial of Dalemain in Cumbria The well known octagonal dial at Dalemain Country House by Richard Whitehead is dated 1688 and shows the time from 4am to 8pm in half, quarter and eighth hours on scales that lie inside the chapter ring and in minutes (with Arabic Nos) on the outer edge. Some of the actual hour lines on these inner scales are missing [eg 6 and 7pm]. There are both inward (arrow with H form) and outward (line and dot form) half hour markers. An elaborate inner 32 point compass with all points named [eg SEbE] and on an adjacent (outer) scale with its reciprocal [eg NWbW] so as to give the sun's bearing. the compass was designed to be used with vertical rod (not present) which was passed through holes in the gnomon. and centred on the compass. Markers on either side of the main 32 points indicate the width of this shadow for accurate centring. Two scales further divide each of the 32 points into 4 and 8 intervals. A half division is provided outside these scales (to the inside of the dial) and marked by an inward line with a three dot arrowhead. Wonderful pierced gnomon with scroll pattern, the whole mounted on an excellent panelled octagonal stone pedestal which is slightly fluted and with no visible base. Design Lat N 54d 40m. More detailed pictures HERE dated May 2009. The Famous Blackamoor Dial of Dunham Massey. This important National Trust dial dates from 1721, is 450mm in diameter and is listed by Heritage England as "Early C18 and is thought to be either by Van Nost or by Carpentiere". Stone with a bronze dial. 2-step stone base with nosings on which is a kneeling African figure clad in leaves carrying the sundial above his head. Nat Grid Ref: SJ7350787376. Thought to be one of five such original figures only three of which are known today. Click on the image here to see a few close-ups of this now (sadly) very corroded dial which nonetheless can still (just!) be used to tell the approximate solar time. The Huge Dial at Grieskirchen, Austria. This huge sundial was erected to mark the 400th anniversary of the town's elevation to municipal status. Click on the thumbnail image here for more details. The dial now even has its own webcam too. The Two Tatton Twins . Yes, we know that the word 'twins' implies 'two' but we just like a bit more alliteration! Whatever, there are no fewer than two horizontal dials at Tatton Park in Cheshire. Not discovered for a long time - and one of them not apparently even yet recorded in the NT collections of such either - these sit there waiting to be admired. One is in the Rose garden (sometimes only on view from a distance because of the roses) and one is near the Italianate garden at the back of the house. They are well worth a look. Click on the thumbnail images here for larger views and for a couple of close ups of the second dial. Two interesting dials. New H.E. record for a pedestal at Wardley Hall. Here's a Valentine's Day present for those interested in dial pedestals! An Historic England list entry discovered by SunInfo on 14-Feb-2019 describes a pedestal (sundial shaft), now forming the base of a table. C18. Stone. Bulbous stone baluster with moulded head and base. The dial has been replaced by a stone table top probably during the C19. Listing: NGR: SD 75787 02185. Bridge End in the Snow! The dial that is located in Francis Gibson's Garden at Bridge End, Saffron Walden is unusual in that it is rarely seen by dial enthusiasts. This is odd since the gardens are very well worth a visit and indeed are listed Grade II* in the UK Register of Parks and Gardens. 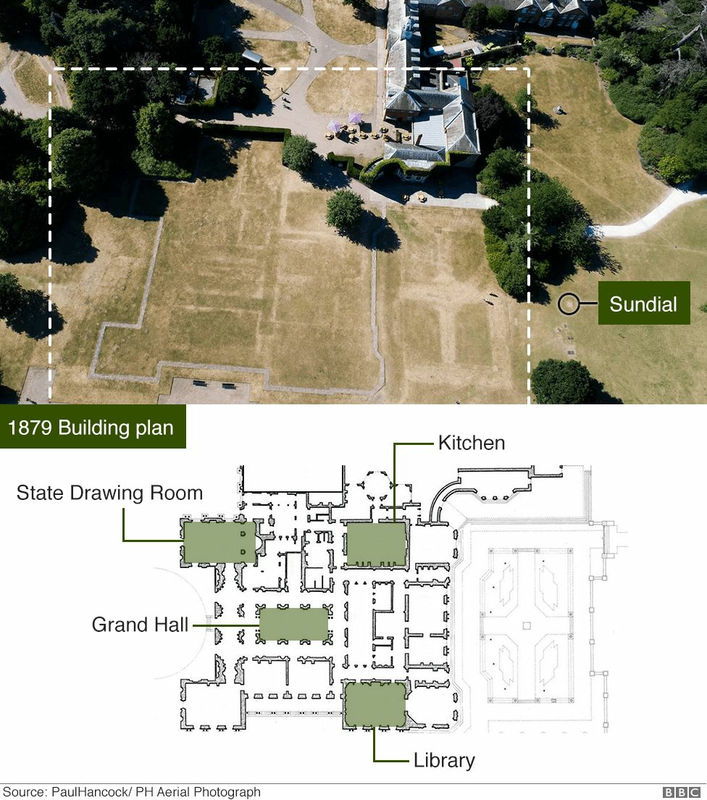 Gibson lived 1805–58 and he constructed a long view from the Pavilion along the Pavilion path to steps and two vases, then to the sundial, seat and balusters. The tapered pedestal is elegantly decorated but sadly today's dial is without its gnomon. The dial plate is however competently laid out with an eight point compass, sun motif and complete with the slightly depressing motto 'Night Cometh'. The pedestal my be viewed in more detail here and the dial plate itself here. 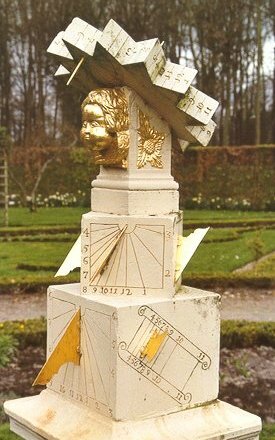 Further Dial Development Planned at Luton Hoo The ever popular 2013 analemmatic sundial at the Luton Hoo walled garden is to be partially relaid and better marked out during the off season of 2018/19 so as to be ready for the good weather next year. It will be recalled that In 2013 the octagonal Luton Hoo Walled Garden celebrated the tercentenary of its builder - the 3rd Earl of Bute. An eminent scientist of his day (though a particularly unpopular Prime Minister! ), it was he who, in the 18thC, had been instrumental in the establishment of Kew Gardens. As a part of the celebrations for this tercentenary celebration, an analemmatic dial was commissioned and largely constructed by the Garden's own team of volunteers. However, what had basically been a straightforward dial delineation task ended up uncovering an extraordinary fact. The garden is nearly aligned to the sunrises and sunsets at the solstices and equinoxes of its location - and it is not clear why! Read about the Earl of Bute and how, with 'Capability' Lancelot Brown, he moved his original walled garden from near the river up no less than 200 feet to the top of a hill, arguably to the most inconvenient location on the estate for a huge five acre garden and one that requires similarly huge amounts of water. Bute combined his interests of botany, astronomy and philosophical instruments all of which appear to be significant in the concepts behind the walled garden. Why was it built like this? It looks like it was the appeal of exotic soft fruits! The San Marco Noon Mark. In our Dial Time Newsletter for April 2016 we published a note about the rarely noticed Noon Mark that exists in St Mark's Square in Venice. It is damaged, rusted, drooping and possibly even now loose as well yet it still shows solar noon to within 13 mins and that after something like 630 years! Seen again in November 2018 - in this picture taken at a solar time of approx 11:51 am - though the shadow has just passed the noon line. Click on the thumbnail here for a larger image. A Sundial Tartan - how about that? Recently the 1890 Kinloch Anderson Sundial Monument in Inverleith Park, Edinburgh was restored by Macmillan Hunter Sundials. As a part of the 150th Anniversary Celebrations in June this year, a unique Commemorative Tartan Cloth - The Sundial Tartan - was produced. Stationery publishers Waverley Books were asked by Kinloch Anderson to produce notebooks in the style of their Tartan Cloth Commonplace Notebooks using the same Sundial Tartan. These Sundial Notebooks are now available, as an exclusive limited edition, to collectors and friends, from Kinloch Anderson. The background to the creation of The Sundial Tartan is a fascinating story which is told in a booklet enclosed with the notebook. An Aberdonian Triad! Three lovely sundials from the Aberdeen region are here described by Denis Cowan in a paper submitted to the BSS Bulletin in early 2018 and available to read on his website. The History Section of the Société Jersiaise The History Section of the Jersey Society in the Channel Islands, runs programmes of historical interest to the Islanders. Sometimes these are published on their web site. Two in particular from the early years of the millennium are of interest to a wider sundial public and we give their links to these here. 2. A brief description of The Sundial at The Parish Church of St Peter In the Island of Jersey which was designed by Harriet James in 2004. The Sundials of the Parks and Gardens of Edinburgh. Here we mark the Autumnal Equinox with an entry about some dials in Scotland! Alastair Hunter of Macmillan Hunter Sundials, a company based in Edinburgh, recently organised a three hour summer walk around four parks in the City: Grange Cemetery, The Meadows, Fettes College and Inverleith Park . All proceeds were in favour of the charity YACHT —'Youth At CHurch Today'. Read all about it at the Hunter Macmillan web site here. The Good News and Bad News about a Dial. The discovery of a rarely seen great declining dial is rightly good news, as is the fact that clearly the dial in question has recently been carefully repainted. So, what then might be the bad news in the heading to this entry? The Sundials of Wisley The Royal Horticultural Gardens at Wisley contain two sundials. The first is located at the entrance to the gardens - almost as you come in - and the second is in the Herb Garden. Both are now modern dials though one replaces an earlier horizontal dial by Barker. The gardens make a lovely day out and the two dials are interesting too. Click Here or on the image for more information and some images of the dials. Then admire 2018's dahlias! In 2016 the BBC broadcast a programme describing how Britain introduced Summertime (daylight saving time) 100+ years ago – a move that was quickly followed by countries worldwide. A quarter of the world now use DST. Like it or not, there’s a persistent British campaigner you can thank.. He came to be supported by Winston Churchill and Sir Arthur Conan Doyle too. Read about the builder from Chislehurst who changed the world! And why his sundial memorial is in a clearing of Petts Wood. The Sundial Society of Flanders, "Zonnewijzerkring Vlaanderen" has published all copies of their Bulletin from 1995 - 2017 as PDFs. They are in Dutch but can be read by those unable to read the language by using the usual Google facilities. The Dial at Boughton House In the lovely rose garden of Boughton House can be seen the Henry Wynne sundial. Displaying a 32pt compass, the times of noon at twelve cities and all set in a 'secured' dial plate of some 425mm diam which is mounted on an octagonal plinth. The cities are marked as Mexico, Charlestown, New York, Barbados, Tenerife, Dublin, Paris, Rome, Jerusalem, Babylon, Surrat and Bantom. The dial shows 4am to 8pm with its numerals read from 'inside' the dial. Charles Darwin's Sundial at Down House is still to be seen at the head of the garden. It is to be found near the verandah although currently and sadly, it is not quite correctly set up. It is a commendably simple but accurately delineated, dial set on a lovely baluster pedestal - clearly positioned for use in earlier times to set the house clocks. It displays the hours 4am to 8pm in 30, 15, 10, 5 and 1 min divisions. Prof IDP Wootton SunInfo is sad to report the death on 16th July 2018 of Prof Ian Wootton at the age of 97. Outside his distinguished clinical role, Ian was a founder Trustee and Council Member of The British Sundial Society. In earlier times he was appointed to the position of Registrar of the Society after David Young had relinquished the role which he had held since the startup of the Society.. Ian also initiated the very first Society-operated webpage, identifying and then implementing the Society's web addresses and acting as webmaster. Read SunInfo's Obituary to Ian Wootton. Ian will be sorely missed by all those who knew him and who are pleased and privileged to have worked with him. A real gentleman. "Is there a point in an analemmatic sundial that can be used with the Zodiac date line to show where the sun rises?”. The answer is of course Yes! A chance to see a real Merkhet The Merkhet (or merjet "instrument of knowing") was an ancient Egyptian timekeeping instrument. It involved the use of a bar with a plumb line and could be used during both morning and afternoon hours. A short video clip shows one such in a museum Here Two of these instruments could also be used, together, to determine North. The merkhet consisted of a string with a weight attached to one end, enabling a straight line to be measured. For the operation to work, two merkhets were required, one aligned with Polaris, the North Pole star. If erected properly, and if a merkhet was on hand, one could estimate quite accurately the time by observing the transits of certain stars as they crossed the meridian and came into alignment with the two merkhets. Previously unknown UK sundial location revealed! The National Trust property of Clumber Park in Nottinghamshire is suffering from the drought. The building that once stood on here was Clumber House - a grand 18th-Century mansion which was demolished in 1938 after a series of fires and the then economic downturn. In the present drought, rooms and corridors of the old house have become visible as stone foundations left in the ground heated up more quickly than surrounding material, scorching the soil above to a lighter shade. A Sundial Missing in Zimbabwe... Imagine, if you will, the interest to a sundial enthusiast when this was spotted in the formal gardens of an hotel near the Victoria Falls in Zimbabwe. Then imagine discovering that the company who made it is still in existence in London yet they have no records of it. A real mystery. Read a bit more about this intriguing puzzle here. Do let the webmaster know if you have any information about what must have been a very well made equinoctial English sundial. The Clifford A. Phaneuf Environmental Center in Springfield's Forest Park, Mass, USA dedicated a new sundial built by artist James Kitchen and commissioned by the Edward Peck family in memory of Ruth Mahoney Peck who shared a great love for the park. The dial is fabricated in steel using a skate blade as the gnomon and a saw blade as a base. It was declared 'open' on June 21 2018. Barnwell sundial 'stands the test of time'. On a bright, sunny day outside the Barnwell County Courthouse (that's in South Carolina, USA) there's no need to check your watch to know what time it is. It is said possibly to be the only 'free-standing' vertical sundial left standing in the USA - can this really be? Installed in 1858 after it was given to the county by State Senator Joseph D. Allen it has recently been restored. It includes an EoT correction table and is additionally unusual to British eyes in having Arabic numerals viewed from the inside of a vertical dial. Read more about this recent restoration. The amazing Coade Stone Dial Discovery - AND we made it!! Recently Weston Park’s Head Gardener made a remarkable discovery. Whilst sorting out an area used for their equipment, amongst the detritus of old urns and shoulder high nettles, they found this sundial base. It is no ordinary plinth, though, being a rare Coade stone piece which was last seen at Weston in the early twentieth century when it appeared in a photograph of Margaret Countess of Bradford and her children. Coade stone is not a real stone but is an eighteenth century man-made ceramic. It was perfected by Mrs Eleanor Coade, in the 1770s and was notable for being twice fired. Examples exist in a few places in London but only one other at Weston Park. Only in recent years has this ceramic formulation been rediscovered and restoration made possible. Look at the pedestal and listen to why it is important HERE. To restore the plinth and to make a dial for it will cost £20,000 - an amount close to 10% of the total park maintenance available to the charity that runs Weston Park, so a crowd funding approach was started and we at SunInfo asked if you who read SunInfo could help too. Appropriately and on the very day of the summer solstice it was announced that the project has been funded!! Britain's beautiful secret sundials An article by Sophie Campbell in the Daily Telegraph in January 2018 drew attention to the many 'secret' sundials that exist in Britain. She wrote: "They are simple, yet complex, a marriage of form and function, often beautiful, frequently unusable (no sun) and they require for their creation a particular combination of skills: mathematics and artistry.". Then read another article Here, this time from the Financial Times - this time all about the sundial designer putting a modern twist on ancient technology and the dials of David Harber. A Very Wet Sundial at Hatfield House! The sundial at Hatfield House in Hertfordshire UK was installed in June 2011 in the garden near the Old Palace. It was designed by William Andrewes of Concord, Massachusetts, USA and is shown here on a very wet Spring day! In many ways a conventional sundial but there is a twist! The dialplate is made up of a gnomonic map with the location of the dial at its centre. The June 2018 edition of the BSS Bulletin is published. Summer Solstice at the Duomo The other day Jim Tallman alerted the sundial community to the 'event' that occurs at (and near) the summer solstice in Florence's Duomo in Italy. There is an aperture high up in the dome of the Cathedral which, around the summer solstice lets a spot of light fall to the floor and pass over a meridian line that was installed in 1756 - though the aperture might have been installed as early as 1475!. It was designed partly so that "the measure of the year and the date of Easter be more accurately determined", according to the inscription still visible on the wall near the choir. If you cannot be there, look at this video of an earlier 'transit'. Thanks Jim for alerting us all to this excellent spectacle. The Dial at Mackerye End is rarely seen since it is a painted stone declining vertical dial dating back to the 18/19thC and mounted on an end wall of the manor house, deep inside its own grounds. In truth it is not a particularly unusual dial though it does indicate time intervals down to 5 minutes and is well constructed. The images here also show a pre-WW2 drawing of the house - with dial in place and an approximate calculation of the dialplate using the declination of S13W established here by using Google Earth and the alignment of the roof line of that wing of the house. It shows a close correlation though interestingly, it is slightly different to the original - probably indicating that the actual wall on which the dial is mounted is not quite in line with the roof and in turn, there is a small difference in estimated declination! Such are the vicissitudes of 18thC architecture... Click on the images for larger versions. Astonishing Neolithic Clay Disc from E Jutland appears to record 2 stages of a full solar eclipse on 5 May 2789 BC. Dr Oosthuizen (Reader in Medieval Archaeology, University of Cambridge) suggests the sun is the larger circle, its rays radiating out like a child's drawing; the moon approaches it from bottom right, & then moves in front of the sun - all as per the diagram.... Click on the images for slightly larger view. But, might this be akin to one of the Los Millares multi-sun artefacts known from Andalucía, Spain, which appear to be connected with the visibility of the constellation Orion and the time of deer rutting? What do you think? A Roman Sundial dating to the 1st century B.C. has been found in Interamna Lirenas, Italy. It was commissioned by a man named Marcus Novius Tubula to celebrate his election to the office of tribune of the plebs. He had his name inscribed on the base of the sundial, and paid for the whole thing “De Sua PECUNIA,” or with his own money. The dial is in astonishing condition and is complete with its inscription - a rare find indeed. 'Unrecorded' dial discovered on the BSS Conference coach tour. This year's BSS conference reinstated the earlier practice of a coach tour of dials and by all accounts it proved a success, not least because a dial was spotted by one of the delegates which seems to be unknown as far as the UK National Register is concerned! The dial is located high on St George's Theatre in King Street, Great Yarmouth. It is a West declining dial painted in bright colours. Click on the image here for a closer look. The Website Devoted to the Burlingham Walks Sundial Trail in Norfolk is now operative and may be seen here. A map of how to look round the seven sundials (and some mass dials on the church) is provided and the whole is accompanied by a series of photographs. Well worth a look. Click the link above or on the image here to visit the site. Happy Birthday, Sundial Atlas! The Sundial Atlas was started 8 years ago, on April 25th 2010, and today it has a new look with new software, renewed graphics, a new faster server and several new features. There is a guide for users (home page, click 'Sundial Atlas' on the left, then click 'logo & guides'). The Craigdarroch Dial - found under a bush! The Sundial, Lichfield Cathedral, Staffordshire. This sundial, previously located near the South door of the Cathedral was removed in 1781 and re-erected in 1785 at the West end to regulate the clock on the tower. It was removed again in 1881 and passed into private hands but it was returned to the cathedral in 1929 and put on a pedestal in its present position south of the nave. It takes the form of a cube dial with gnomons and time scales on each face. The Slate Sundials of Joseph McNally. The slate dials of Joseph McNally are delightfully pictorial and they add to a long tradition of slate dial making in Ireland. Read this excellent article from the BSS Bulletin by joint authors John Davis, Michael Harley and Harriet James which is available to read on the web courtesy of Flowton Dials. The Queen and Sir David Attenborough saw the funny side when they came across a strangely placed sundial in the grounds of Buckingham Palace.. The dial, once placed in a suitable place now rests in the shade of nearby trees. The scene is from a forthcoming BBC documentary, The Queen's Green Planet, to be broadcast in the UK on ITV at 9pm on Monday 16 April 2018. We read on 13th April that the dial has already been resited! Howard House sundial restored at last. One of Norwich’s most significant historic houses has been restored at last. The Grade II* listed Howard House had stood empty for more than 25 years and it had even been designated as at risk owing to its deteriorating condition. But after the restoration, its roof and external facades have now been carefully repaired and restored. Howard House, on King Street, dates from the late 16th century and originally was owned by Henry Howard, Duke of Norfolk. The picture shows the West declining 1840s sundial as it is now following the restoration. Click on the image for a larger version..
Hitchin's Physic Garden Sundial This month's dial is the most unusual one that is in Hitchin's so-called Physic Garden. The garden commemorates the first commercial production of herbs in 1846 by William Ransom, a member of a prominent local Quaker family. It opened on 20th May 1990 in the grounds of Hitchin library and museum in Paynes Park. It is divided into four sections: Household; the William Ransom border; External Ailments; Internal Ailments. It contains a most unusual 1990 sundial in the form or a mortar and pestle dedicated to a late president of the Trust. The motto reads "Disease doth oft rise above medicine". Click the image for a larger version. The dial was made by Joanna Migdal. There is a wonderful dial in the gardens of the moated manor house 'Menkema Manor', in Uithuizen, Holland 53.4°N, 6.7°E. Information sent to the Sundial Mail List courtesy of Frans Maes tells us that it is an elaborate multiple dial, dating from 1722. The base is formed from two stacked cubes, one rotated by 45° compared to the other. Each side of the cubes has a vertical dial, though the gnomon of one has been wrongly aligned.. The gilded head is surmounted by a twelve-pointed star. The edge of each point serves as the style of a small polar dial, the dial plate of which is split over the two adjoining sides. A look at the Savoy Centenary Sundial The Savoy Hotel was founded in 1889 and 100 years later in 1989, Christopher Daniel was commissioned to design a dial to celebrate that event and of course to mark its foundation by Richard D'Oyly Carte. Look at some of the images of how it is today and read the extensive description at its base. Check out the dials on the Burlingham Walks of Norfolk. Courtesy of Annabel Payne, see the new website, which covers some of her father David's dials that have been carefully located in the woodland trails located North of Lingwood Village. The 3,000 acre estate was acquired by Norfolk County Council in the early years of the 20th century and became part of a scheme to provide farms for heroes returning from the First World War. See more of this site Here. A 17th century brass sundial was prised from its stone plinth outside the front door of St Tysilio's Church between Llanymynech and Four Crosses in Powys. Churchgoers noticed it was missing on January 11 2018 but they can not say when it was last seen. Dyfed Powys constable Rhodri Treharne said it was an unusual artefact that police wanted to re-unite with the church. Mrs Carol Davies, churchwarden, said the sundial is about eight inches in diameter and a golden brass colour. The Rousham Sundial is February's dialling 'find'. A lovely small sundial by Dolland set in a wonderful garden designed by William Kent in the 18thC. The Cannon Bridge House Sundial - Revealed!! This is rather a hidden gem in London. Part of an immense Roof Garden that once was open to the public this is now a private garden - about an acre in area! When open it was available for hire for events in London but now it is sadly closed and only very rarely available to view. SunInfo has however been able to obtain a few photographs of the garden and - more importantly of the dial - and these may be seen by clicking on the image here or on our link to our Cannon Bridge House page. A rare opportunity to see this particular dial - and one by a relatively unknown modern maker too! Can you help identify the maker? A Courtesy for Meridian Line users provided free by Spot On Sundials! The original brass Spot-On Sundial was designed by Piers Nicholson and introduced to the market in 2001. Since then, more than 900 customers all over the world have bought them as presents for big occasions or simply for their own pleasure. To help enable the set up of any dial Piers also produced a very handy web based Time of Noon calculator Here. It's also useful as a free resource when predicting when the image of the sun will pass any meridian line in the world! The table produced Here shows the local clock times (CET) for solar Noon every day of the year for the meridian line in the Basilica S. Maria degli Angeli e dei Martiri in Rome which is at 41.9031N, 12.4969E. Just add one hour when your sighting is during summer when CEST applies. Neat. A short note on how the design latitude of a dial plate, with or without the gnomon present, may easily be determined, with graphs to allow a good estimate to be obtained. A Fine Example of a Cross Sundial has been located in the SE of England. It is a particularly elegant example of a rare dial type since only some 35-40 such dials are known in the British Isles. This dial further excels in having its own equation of time scale on its 'front' (South) face, a motto on its base and time markings of 30,15 and 5 mins. Now a little overshadowed by trees it is nevertheless still 'operating'. Click on a thumbnail for a larger image. The National Trust and the 'Housewife's Trick'? The garden at the wonderful Wisbech property, 'Peckover House' is especially lovely at this time of year. Not only that but there is a sundial just outside the greenhouse which greatly enhances that part of the garden. Odd therefore that when these images were taken - it was at 09:21 GMT in March - the dial was showing just over 10:30! Surely the NT has not succumbed to AP Herbert's rather unfairly named 'Housewife's Trick' whereby a sundial is turned so as to indicate summer time? Given its age and the extent of corrosion present it's hard to read this dial exactly and thereby to work out just how much the dial has been turned but, despite every diallist's 'horror' at such a practice, it has to be said that in summer, in the middle part of the day and at the latitude of the UK it is not quite so inaccurate as one might think. At least it might help to prevent the frequent comment made by members of the public when checking a sundial with a watch, of 'It's wrong'. So maybe the misjudged housewife has done us a service after all? Do you wish to Subscribe to receive material directly from SunInfo or even Unsubscribe from receiving such material from SunInfo, whether by email or ordinary mail? Click here and enter your preferences there. You may also visit www.bit.ly/nosuninfo at any time for the same purpose. Remember an entry that used to be here? Go to our Archive Page1 or to our latest page Archive Page 2 We place the older stories from the SunInfo page there after they have been removed from the main page to make room for more recent news. So, if you want to look for something you once saw on SunInfo which is not there now, here's the place to look. Entries are frequently dated with their original dates of insertion/amendment on the SunInfo page and they are placed here in order of their removal from the SunInfo web page. But why not browse the Archive anyway? There's a lot there. BSS Bath Conference 2019 This year the conference will be held at the Bailbrook House Hotel in Bath from 26 to 28th April. One of the top hotels in the city, Bailbrook House Hotel is an historic grade II* listed mansion, located just a few minutes from the centre of historic Bath with on-site complimentary parking. As BSS is an English Charity the Conference is Open to all, not just to BSS Members. Full NASS registration until April 14th costs $310-$322 depending upon dinner selection. After April 14th the cost increases to $335-$347. A Meridian Anniversary! On 22 October 1884 the Greenwich Meridian located at the Royal Observatory was selected to be the common zero of longitude & standard of time reckoning worldwide. Click on the image for the decision details. The Pittsburgh Blog! Fred Sawyer, President of NASS recently alerted the Sundial Mail List to the fact that Glenn Walsh, the author of the American Space Watch Tower Blog, was at the NASS Conference 2018 throughout most of the sessions and he later contributed an article on his blog which summarises the recent meeting quite well. Take a look here at what he wrote. The Jantar Mantar monument in Jaipur in Rajasthan, India is a collection of nineteen architectural astronomical instruments built by the Rajput king Sawai Jai Singh II, and completed in 1734. The 'Dials' of Konark. There is a 13th-century sun temple at Konark near Odisha, India which is attributed to King Narasimhadeva I of the Eastern Ganga Dynasty of about 1250 AD. Dedicated to the Hindu sun god Surya, what remains of the temple complex is a 100-foot high chariot with 24 immense wheels drawn by horses, all carved from stone and quite accurately aligned E-W. Once over 200 feet high, much of the temple is now in ruins. The structures and elements that have survived are famed for their intricate artwork, iconography, and various themes. The wheels, spokes and other divisions of the wheels are arranged in a form and number similar to modern time keeping and consequently they invite use as sundials. A simple calculation of the angles of the spokes between 6am to 6pm on the South wheels shows why. Click on the images for more! The Nazeing Church Sundial - a restoration project by Barrie Winter and reported here by Ian Butson. Lower income and higher costs at BSS!! The 2017 Report & Annual Accounts for the British Sundial Society have recently been published and may be examined at the Charity Commission Website or here courtesy of the CC. Compared to the position in 2016, they show a reduction of overall income in the year of £3,258 and at the same time an increase in expenditure of £2,053. As a result, only £2,192 was added to Total Society funds in the year. Fees for independent examination of the accounts and (new for this year) for professional preparation of the claim for gift aid, have this year soared by 127%. Indeed, something approaching 8% of all membership fees currently appears to be being spent on such bought-in professional services. "I am at a loss to understand how they justify spending on professional services"
Unusual Dial in Grantham We were first made aware of this interesting dial in 2017. It is in the one-time 'Clockmakers District' of Grantham at the junction of Welby Street and Westgate. It was delineated by Charles Westwood in 1790 as a west declining dial that would also show the equinoxes and solstices. It has only relatively recently been recorded in the National Sundial Register where its reference is SRN 6705. Unusually for such an old dial it still retains its original pin nodus. Read more of an analysis of this dial, its features and its 'oddities' by going to this link here. If you can contribute to this analysis or even resolve some of the so called oddities do contact the webmaster. SunInfo was once again delighted to publish its FREE Spring Newsletter to accompany the 2018 Conference Season. Here you can find a few stories taken from the SunInfo web pages in the past months, some new topics and some updates on older stories too. In the usual PDF format, this four page Newsletter contains news and items of interest to any diallist. Once again SunInfo was delighted to publish its FREE Spring Newsletter to accompany the 2017 Conference Season. Once again SunInfo was delighted to publish its FREE Spring Newsletter to accompany the 2016 Conference Season. Here you can find a few stories taken from the SunInfo web pages in the past months, some new topics and some updates on older stories too. In PDF format, this four page Newsletter contains news and items of interest to any diallist. SunInfo's first FREE Spring Newsletter was published to accompany the 2015 Conference Season. In PDF format the four page Newsletter contained news and details of interest to any diallist. STOLEN! Do you suspect that a dial known to you might have been stolen? Sadly many dials have been over the years. A few recent thefts are mentioned in the boxes below. The BSS has a list of stolen dials (sadly not updated since 2010) which is accessible here. There are some 44 dials listed. If when you can get to see them and you recognise any, do let the BSS Registrar know. 2014 STOLEN! Thieves stole a sundial from a plinth in a Morley churchyard, where it had stood for 250 years. The dial had been made by clockmaker and scientist John Whitehurst and had been in the grounds of St Matthew's Church, in Church Lane, Morley. The instrument, which was made from bronze, was reported stolen on Sunday, February 23 2014 and had last been seen at the start of January. Please inform the webmaster if you have seen this dial. 2014 STOLEN! Thieves in Blickling Hall's secret garden lifted and made off with the sundial and pedestal which is of carved Portland stone and stands 113cms high. Jo Bosch, Blickling’s marketing and visitor manager, said the bronze sundial a replacement for an earlier dated from the late 18th or early 19th century, had a metal plate on it which said “Brookbrae Ltd, London”. The theft happened between 10am on February 6 and 10.15am on February 7 2014.Please inform the webmaster if you have seen this dial or pedestal. 2014 STOLEN! Police are appealing for help in tracing a valuable sundial stolen in Sunderland between noon on Monday, May 5, and 2pm on Friday, May 9, 2014 from a rear garden. The stolen sun dial is a distinctive brass Grande Armillary Sundial Ensemble, 56 inches tall, believed to be as per the image and made by Henri Studio of Illinois, USA. It is worth hundreds of pounds. Click on the image here for a larger view. Between Dec 22 2014 and Jan 18 2015, a large brass armillary sphere sundial disappeared from Rabley Park, a historic 12-acre estate in Packhorse Lane, Ridge. Police say the large ornament can only have been moved by a vehicle. It has several engravings, including “Do not squander time for that is the stuff life is made of’, ‘Clacton-on-Sea’, ‘Hemel Hempstead’ and ‘Newcastle’. A Grade II listed sundial dating to 1761 has been stolen from a churchyard in Conwy and its stonework smashed. The stonework holding the bronze sundial at Conwy church was smashed into three pieces. Rev David Parry, vicar of Bro Celynnin, said the theft was noticed on Friday morning and reported to police. "It's very sad. In taking the top, the thieves have severely damaged the stone. It's been part of Conwy's history for a long long time," he said. "It's a well known landmark, listed in its own right, and we're at a loss to know why someone would want to damage this." The dial is believed to be SRN 3262, dated 1765, 360mm dia includes an EoT scale and was made by Mereidh Hughes, of Conwy. NASS (The North American Sundial Society) held its 2018 Annual Conference from Thurs 16 Aug - Sun 19 Aug in Pittsburgh, Pennsylvania, USA. The conference was held near the famed University of Pittsburgh campus with its Cathedral of Learning at the Hilton Garden Inn, Pittsburgh University Place 3454 Forbes Avenue, in Pittsburgh. Read the Conference Blog here. The BSS Conference 2018 took the Society to Norwich - to the Maid's Head Hotel there. The Conference ran from Friday 20 April to Sunday 22 April, 2018. See a summary of the BSS 2018 Programme. Only 57 delegates attended. On arrival one of two short walks were planned in Norwich itself for the Friday afternoon and in what for many was a welcome break from recent venues there was a coach tour to view David Payne's sundial trail on the Saturday afternoon. See more about what dials were seen. Full package prices were £340 for single occupancy, £520 for double. The Day Delegates rate is £160. As usual the conference was open to non-members as well as members and at no difference in price. See the delegates out on the tour. The ULTIMATE Sundial Conference of 2017! 2017's year's NASS Sundial Conference really was the one to visit. The meeting took place in the Clayton Plaza Hotel, 7750 Carondelet Ave, Clayton, Missouri 63105 August 19-22 2017. Why was it the ultimate one to attend? Well, during the conference there was a total eclipse of the sun! Delegates enjoyed 3+ days of gnomonic presentations and sundial discussions. There were some tutorial sessions for Aug 19th and the tour this year was very special with a ring side seat to watch the August 21st Solar Eclipse. NASS had reserved space at Jefferson Barracks that allowed an unobstructed view of the eclipse away from the expected crowds.. The 2017 BSS Spring Conference took place just outside Oxford. Have a look at our special web page at the link below to see where it was held, what the hotel is like, how to get to it, delegate rates, what else to see and do, how the conference was arranged and the two planned visits to dials and the conference dinner. All Information is updated regularly. Our Special BSS Conference page included notes written to accompany Dr Philip Pattenden's conducted tour of The Sundials of Oxford Colleges which were visited during the Inaugural BSS Conference in 1990! Compare then and now!! Only on SunInfo!! You can find information about this conference here (or click on the image above). Only about 55 delegates attended in 2016, even fewer than last year. Read news of what happened there, the programme and how the conference was arranged, the plenary lecturer, how easy it was to get there by land and air, details of the hotel itself, where you could find parking, the conference format, what there was to do, how to get taxis, where the bus stops are, find nearby sundials and even how to see the sights of Liverpool too. Which BSS Conference was it? Are you a long standing member of BSS? Can you remember at which conference the delegates were given this little notebook? When closed it measured 4¼ x 3 ins and contained a pad of paper, an equation of time chart and a two year calendar! Click the image to find out!! BSS's Net Current Assets Fall 5¼% in a year. The Charity Commission has received BSS's accounts for 2015. For those wishing to see how the Society fared in those past twelve months, they may be examined Here. It is thought largely to be because of conference losses. Earlier Accounts can be conveniently checked and compared in our Document Archive below, see the section 'Policy, Guidance, Rules, Information Sheets & General Documents'. Members attending the 2016 Society AGM got few answers to this further BSS blunder. Every time the sun shines in Seattle, it sheds light on Woody Sullivan and his mission. "I am out to make Seattle the sundial capital of North America, I just love the irony of it," said Sullivan. More here. Waymarking™! Waymarking.com is a super way to see the dials of the world from your armchair and to read a little about them too. Have a look at SunInfo's new Waymarking page here. It includes links to the waymarking website and to specific sets of dials. An early English 'Scientific' Sundial with exactly calculated, unequal hour angles has been discovered at Scadbury Manor, home of the Walsingham family. The very family that was so connected with the Tudor Court. More information here. Sundial replaces Floral Clock at Swadlincote's Eureka Park in Derbyshire. Sited in the same place as the original 1937 floral clock, a new sundial has been installed as a part of restoration work being carried out on the whole park by South Derbyshire District Council and funded through a £547,316 grant from the Heritage Lottery Fund and the Big Lottery Fund. The FREE 2015 SunInfo Calendar is still available here!!! With one A4 page for each month, this FREE PDF pictorial calendar can be downloaded and printed off to give you images of twelve UK sundials. Each month includes the equation of time correction for each day of 2014 and a separate page allows longitude corrections to be estimated for anywhere in the British Isles. Check it out and download it here. Only a 3.7MB download. Just print it on suitable paper stock. People have still been downloading this beautiful calendar long after 2014 !! Why don't you have a look too? Then look at our 2015 one! A Calendar for 2002? Why ever should sundial enthusiasts wish to look at - let alone keep - a copy of a calendar for 2002? Have a look at our photogallery here to see why! Fotheringham's Calendar. John Knight Fotheringham FBA (14 August 1874 – 12 December 1936) was a British historian who was an expert on ancient astronomy and chronology and who established the chronology of the Babylonian dynasties. In 1929 he wrote a 13 page monograph The Calendar which concisely and clearly describes the history of calendars from that of the Egyptians to the present day. Key facts about BSS. Here are details of the Society, the members of its Council and its management, its appointed and excellent Specialists, how to access its website and its Facebook page, how (and why!) to join the Society, how to send payments to BSS via credit card or PayPal and many recent annual accounts. In fact more or less everything you need to know about BSS is here - warts and all! There's even help for BSS Members who may like to understand the background to the worrying oddities in today's erratic management of the society. BSS's "1960's" management approach. In October 2011 the incoming secretary of BSS suggested using a S.W.O.T analysis of the Society's Strengths, Weaknesses, Opportunities and Threats. This is now a rather discredited approach to management (because it can actually limit performance) which was first mooted in Stamford in the 1960s. It is therefore more used nowadays to summarise the outcome of a more professional analysis of a business. However one good use of it is to provide an historical perspective and allow outsiders to judge for themselves what progress has been made in any intervening period. Two analyses were prepared in 2011. Have a look at the more detailed of the two here and check which of the suggestions in it have subsequently been adopted and which not! Integrity: There's no better test of a person's integrity than their behaviour when they are wrong. (Marvin Williams). Now, even after 2017 might not these form useful advice for today's BSS Council - and from their own Examiner no less? Greenwich Dial 'Restored' by BSS President Christopher Daniel! In 1969 the 'Meridies Media' noon mark mean time sundial, designed by Dr Tadeusz Przypkowski, with amendments by Christopher Daniel, was installed on the south wall of the Meridian Building in what was then the Old Royal Observatory at Greenwich. Over the years it deteriorated and had to be taken down. In 2009 a movement was started to reinstate a replica. Chris Daniel, who had been curator of the sundial collection of the National Maritime Museum at the time of the original installation and who is now the President of BSS, was asked to design the replacement. This he has undertaken without a fee. The dial was formally opened by BSS Patron, Sir Mark Lennox Boyd on Wednesday 10.10.12 at 12:30pm. It represents a fitting Diamond Jubilee dial in Greenwich Park. Some early notes about the replacement are here and further details of the ceremony can be found here. An image of this dial appears in the Wikipedia article about Sundials. New Images and an article are available of the most recent dial commission by BSS President, Christopher Daniel MBE. This is the Noon mark on the Guildhall in Faversham, Kent which was declared 'open' by the Town's Mayor in April 2013. We are now pleased to be able to present a photogallery of the results of this commission and an article about it. More details in the panel opposite (see: "The Faversham Dial"), or go straight to our Faversham Photogallery and/or to Chris's Noon Mark article. To learn even more about this sort of dial consider joining the British Sundial Society. You will surely not regret it. See the Christopher Daniel Sundial Collection as a slide show Here. Just sit back and relax! 'Forbidden' from doing so by BSS! Direct hyperlinks to the BSS website from SunInfo were at one time being blocked by BSS. That stopped for a while when the new BSS web site opened but then from late 2015 some visitors to SunInfo reported that this was happening again. You might well wonder why any professional entity like BSS should want to make it hard for visitors like you to reach them. The more so when the advisory 'error' messages you receive actually says in print what they are doing! All our visitors will know very well that this web site is, and always has been, very supportive of the concept and importance of a British Sundial Society; although it has never had any truck with the many apparent blunders, secrecy, cover-ups or obfuscations that some might have come to see as emanating from the Society today. The latest issue to report is, we feel, another rather unprofessional and ineffective attempt by BSS to bar linking from this SunInfo website (and not apparently from others) to pages of the BSS web site. Clearly the concerns expressed by so many contributors on SunInfo about BSS and its management must have real merit if BSS would rather you did not read them. So, what is happening? Who would ever want to block visitors from a website if there's nothing odd going on and especially when what is being said is true? Well, if you do find a BSS page 'Forbidden' to you - without any reason simply select the whole link, right click and select 'Open Link in New Tab'. It's as easy as that! "The owner of this website (www.sundialsoc.org.uk) has banned your access based on your browser's signature (24ddd725bccc3452-ua32). CloudFlare Ray ID: 24ddd725bccc3452 • Your IP: 86.180.232.181 • Performance & security by CloudFlare" . In this case simply set your browser to Incognito and go back in. You can also go to our special links page ►BSS links . Indeed, this new SunInfo links-page is now in a limited way, a sort of 'One-Stop-Shop' for some key BSS pages; so you can use it from within SunInfo to peruse as many of the provided pages of the BSS website as you like. Give it a try and thank you for staying with SunInfo. It is very much appreciated. Remember: SunInfo does not restrict linking to any of its pages by any website and SunInfo reports facts. Recent BSS Conferences. Want to see summaries, photographs, programmes and delegate reviews of previous BSS conferences or the plans for the next one? The Nice Dials of Newstead There is a wonderful ruined abbey in the Gothic style at Melrose in Scotland. It was no longer maintained after 1544 and indeed it is recorded that the last monk there died in 1590. Part of it was destined to rise again to be used as a parish church from 1610 -1810 and it was presumably in this period that many stonemasons were needed. Whatever, it is recorded that many of these stonemasons lived and were trained in the nearby town of Newstead and whether or not that is the reason, there are several stone sundials in Newstead mostly dated to the 1650s - 1780s. Denis Cowan (of course!) visited Newstead in 2011 and he later published a fascinating article about these dials in the BSS Bulletin. Well worth a read. There is at least one with its mason's mark, one was previously thought to have been a date-stone and one that is now stored out of the weather. Nonetheless there are two still thought to be missing. Maybe they are yet to be found? There are two vertical declining dials at Grimsthorpe Castle! Historic England's Listing Details for Grimsthorpe Castle in the parish of Edenham in Lincolnshire, appear to only show one vertical declining dial at this property, yet there are two - both in 'reasonable' condition for their age. More than that, the larger one is still showing accurate Local Solar Time too. Read a little about the castle, find out where the dials can be seen on the building and have a look at two photographs of them. Then, marvel at just how well the larger one is telling the time even today. All here. Information and documents held here on our servers are in the public domain or were drafted by authors/editors who, as the (or as joint) copyright holders, have given their permission for their placement here. Other important information is referenced by links to their internet location. Following a long standing practice agreed at the time by the then BSS Council, as document originals become available on the BSS website and as webmaster time permits, their mention here is changed to a link to the copy on the BSS website. Register Ramblings was the name given to a one-time regular entry in the society's Newsletter. The column was started by Patrick Powers when he took over as Registrar in 1997 with the purpose of keeping the membership informed about progress with the National Register of sundials. It was produced during Patrick's 10 year tenure as Registrar from the beginning of 1998 to the end of 2007. All are in Word 2003 format. The Newsletter column has been continued by the current Registrar (John Foad) under the title Register Notes. Some of his more recent editions may be seen on the BSS website. DialTime: is by way of being a similar publication to the Recorder but is published intermittently (usually annually) by SunInfo. The Society was indeed fortunate when Graham Aldred took over as Secretary for he transformed the record keeping and policy structure of the Society. Prior to Graham's Secretaryship there were few, if any, written policies or even guides for trustees and specialists. Additionally and because of the Society's small size, past Council decisions had rarely been recorded by former secretaries other than in the (then unsearchable) minutes. This section lists just some of the Society's approved policies, rules, guidance and other general documents that have been drafted or edited by various trustees as a result of his initiative. All documents are included here with permission of their authors (or their editors at the time). Policies may of course be changed at any time by a majority vote of the trustees; for this reason check before you rely on the minutiae of any policy. Where a policy proposal was agreed by the trustees without any change, the original proposal was sometimes used as the policy document. Since April 2011 one policy (that relating to Reserves) has been abandoned, even contrary to a prior agreement with the Charity Commission and without informing the Commission too. Another (the Expenses policy) has not always been implemented as intended. These serious and disquieting issues led to the resignations of two trustees in 2011/12 - the first resignations of trustees that the society has experienced in its history and despite these, both issues remain unresolved even now. This site is continually being updated with more documents, news and analysis. Want to be able easily to find this webpage again? No problem, just go to bit.ly/suninfo (you don't need any 'http' or 'www') Don't forget to Bookmark this page in your browser too. Or simply Google 'SunInfo Sundial' to find us on the first page of hits. Got sundial information you would like us to include, mention or link to? Where are the sun and planets at the moment? Want to know the positions of the major planets today? Each line of the grid corresponds to ten degrees in celestial longitude (right ascension) and latitude (declination). Throughout the year, the sun and planets all move from right to left through the 360 degrees of celestial longitude. The display shows the sun's declination as it moves up and down either side of the central horizontal line between between plus and minus 23.5 degrees. It shows where the planets may be found in the sky and it well demonstrates their wandering motion that gave us the word 'planet' from the Greek πλάνητες ('planetes'- wanderers). When the Sun is on the central horizontal line its declination is zero - an equinox. The autumnal equinox is marked by the sun being in the centre of the display. The vernal equinox is marked by the sun reaching the extreme left of the display (the so called first point of Aries) and starting back in again from the right. The date is shown in the format mm/dd/yyyy. The BSS Chairman's Radio Interview! BSS Member Mike Shaw appeared on a recent edition of the BBC's Antiques Roadshow in order to have two of his heliochronometers valued. Click here to see the clip Best with Broadband . The Sundial Atlas Sundial Atlas is a public website, the brainchild of gnomonists Savian Fabio and Fabio Garnero. It was created to give all dialling enthusiasts a tool to document and search for images and information on sundials around the world. Do you wish to Subscribe to receive material from SunInfo or even Unsubscribe from receiving future material from SunInfo whether by email or ordinary mail? Click here. Assistive Technology This site may not be suitable for users of assistive or some mobile technology. The multiple topic nature of this domain and its many and very varied links prevents the full and proper installation of such technology. The Webmaster welcomes enquiries about any specific problems that a visitor may have and will always try to assist where possible. Links & Change Policy This web site does not use hot linking. In collating information that may be of interest to our visitors, this site like many others employs hyperlinks to other informative websites. In the interests of clarity and speed such links will usually be so-called deep links - ones made directly to the information of interest on the remote site rather than ones simply to its home page. This policy has been adjudged legal under EU and UK law and is summarised here. However despite this, where links to commercial sites are involved (and where advertising and the like might be circumvented by the use of deep links) then links will usually be made to the home page of the website in question and any necessary secondary information will be provided regarding subsequent navigation. If you believe that we have not adhered to this policy or you wish to ask us to use home page linking for your site then please do send an email giving full details to the Webmaster. Sometimes on this website links may be specified in full and these should simply be copied and pasted into a separate tab of your browser. This is especially true where attempts have been made to bar deep links by recognising and barring links from the hosting URL. In such cases linking can simply be achieved by copying and pasting the link into your own browser. This website operates a policy of 'continual improvement'. Where errors, spelling mistakes or desirable layout changes and similar issues may come to be identified they are corrected without any erratum being published. Copyright This website is managed independently of any other sundial related site. The material in this and any connected pages is sourced from several people and resources and it changes regularly. Commentary and other material herein will also change in emphasis and at any time may not reflect the policy or opinion of any national sundial society including the British Sundial Society, its trustees, its specialists, its members or even the views of the owner of this website. Whilst providing a forum for comment, which may sometimes be critical, it seeks to be a supporter and a promoter of the British Sundial Society, its objects, its concept and its charitable status. We try very hard to ensure that the information and views expressed, on these pages are both complete and correct and that no copyright has been infringed. Fair-use is claimed where images and text are used in news related entries and links. Document text is chosen and published on this website with the author(s)' permission on the basis that outwith a contract of employment at the time of writing or a pre-existing or any known subsequent legal transfer of rights, the copyright in the text is assumed to rest with the author and that his/her permission is sufficient to permit publication. If you have noticed an error or an omission on this or any other page or can suggest an improvement, a useful addition, or if you believe that any specific copyright may have been infringed, wrongly attributed or has been the subject of any actual or implied transfer of rights away from the original author, then please do send an email giving full details to the Webmaster and action will always be taken, apologies issued and appropriate and corrective text inserted. Received comments will be published. See here for details of any such. Except where permission for use has been specifically obtained and stated it should be assumed that under the Enterprise and Regulatory Reform Act (2013) and the Copyright, Designs and Patents Act, 1988, copyright is claimed over all images on this domain. Sundial Society Websites with English text The North American Sundial Society web site may be reached at http://sundials.org/. The Dutch sundial website (with an English section) De Zonnewijzerkring may be reached at http://www.de-zonnewijzerkring.nl/. The longest established English language sundial web site is probably Sundials on the Internet at http://www.sundials.co.uk. The official British Sundial Society Web site may be found at BSS Web Site. The BSS Facebook Page can be reached at www.facebook.com/sundialsoc. This however is not currently being maintained. When operating properly, the Facebook page offers a message board facility by which anyone may make comments and ask questions about dialling and/or the society. The British society also owns the domains www.sundialsociety.org.uk and www.britishsundialsociety.org.uk. When not in use for development purposes these automatically link to the official site. The Sundial Association of New Zealand operates an English Language Sundials Blog: http://sundials-rosaleen.blogspot.co.uk/. Websites in languages other than English may usually be understood by using Google Translate. © 2011, 2012, 2013, 2014, 2015, 2016, 2017, 2018 Patrick Powers and other authors. All rights reserved. Property rights: All trade marks, copyright, database rights and other intellectual property rights in the materials on this entire Web site of ppowers.com (as well as the organisation and layout of this Web site) together with the underlying software code are owned either directly by Us or by our licensors. Without our prior written permission, you may not copy, modify, alter, publish, broadcast, distribute, sell or transfer any material on this Web site or the underlying software code or photographs (linked or embedded) whether in whole or in part. However, the contents of this Web site may be downloaded, printed or copied for your personal non-commercial use on a 'without prejudice' basis. SunInfo is not responsible for the content or the operation of links to other external websites, all of which are provided for convenience only.